Versatile hair retexturizing services that permanently transform hair by smoothing and softening the texture to completely straightening the hair while leaving it soft, silky, and easy to manage. **Talent level not available at all locations and subject to availability. Relaxers are a way to straighten and tame thick, curly and highly texturized hair. 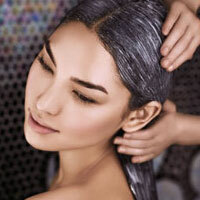 Relaxing frequency should depend on the individual’s hair thickness, damage levels, texture and growth. If you have relatively fine hair, it’s recommended to wait until you have at least 3/4 to 1 inch of new growth. This will help prevent damage. If you have thick and coarse hair, the recommended length is at least 1/2 inch. Therefore, the normal relaxing frequency is every 8-14 weeks. Complimentary consultations are strongly recommended.